The Story of "The Diagnosis "
This automata project started with my desire to do a project that incorporated magnets to give a "magical" aspect to the motion. There are many classic automata that do a great job of this and I wanted to give something a try. In this automata I felt that by the doctor removing his glasses it would add some emotion to the piece as well as a little mechanical wonderment. In "The Diagnosis" a skeleton and her spouse are visiting the doctor to get he results of lab tests and hear her diagnosis. 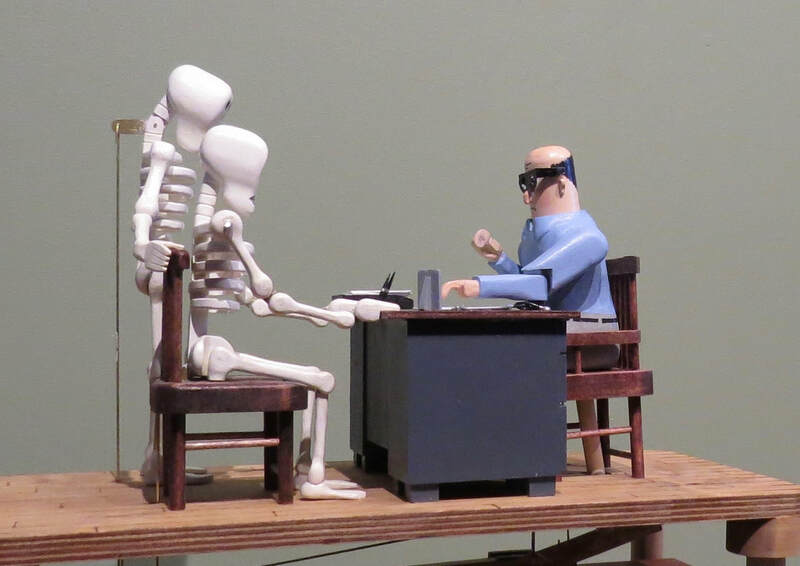 As Doctor Noneck (named for his thick neck that allows internal moving parts) scans the report on his desk, the skeleton's spouse nervously nods his head in understanding to the doctors words. When he lowers his glasses to deliver the disappointing news, the female skeleton falls forward in despair and her spouse throws back his head in shock. The doctor then replaces his glasses and the story repeats. I didn't intend for the story to be so sad as it turned out on completion. Although I started with a thought of what the delivered diagnosis was, I decided to keep it to myself and let the viewer decide for themselves. ​The biggest challenge was coordinating the magnets movements and getting the glasses to slide on and off smoothly. The action could use a little more tuning to further smooth the action and improve repeatability. It was a learning experience! I hope you enjoy the piece. Before I assembled the characters to the mechanism I shot a brief video to explain how the mechanism worked. I realized it is difficult to see all the cuttings on the cams but by watching the follower ams you should be able to get some sense of motion. After this video was shot I added a counterweight to the end of the follower that controls the arm movement so the glasses were grabbed more firmly. You can see the weight in the other video. oh and excuse the mess shop in the background!